Domestic oil production in the United States is expected to explode over the next decade as other energy producing countries struggle to fulfill world demand, according to an analysis of Energy Information Administration (EIA) data. 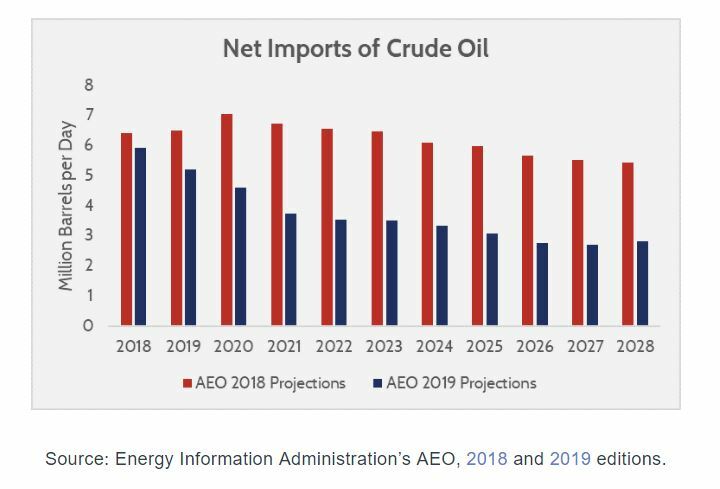 More production leads to lower prices and ultimately a reduction in oil imports, American Action Forum noted in a detailed analysis of EIA’s 2019 Annual Energy Outlook (AEO). The increase comes as Canada, Venezuela and other oil-rich nations stumble to meet global energy demands. Domestic crude oil production is expected to increase 34 percent from 2018 to 2028. In 2018, the AEO estimated an increase from 9.9 million barrels per day (mbd) to 11.5 mbd over the same time period, an increase of only 17 percent. Canada’s nationalization of pipeline projects will also lead to a lower amount of production. “Recent leases of federal land will contribute to oil and gas production, and this Administration has made those resources easier to pursue,” Rossetti said. TheDCNF received an advance copy of the analysis, which also suggests the U.S. is on its way to becoming a net exporter. AEO projected in 2018 that the U.S. would import 5.4 mbd in 2028, but this year’s report projects net imports by 2028 will be down to 2.8 mbd, or nearly 50 percent less than previously expected. If that trend holds, then the U.S. oil industry will come closer to fulfilling Trump’s mission of making the country energy dominant. The analysis also shows that consumers will see a major benefit as production tilts upward. American oil producers can expect roughly $687 billion more in cumulative production value over the next decade, which amounts to a 19 percent increase over last year’s AEO report. Increased supply means lower prices and more value for consumers, most of whom rely on low gas prices for their livelihood. The U.S. last year surpassed both Russia and Saudi Arabia to become the world’s largest crude oil producer. This comes as the Trump administration works to rollback Obama-era rules. Recent reports show Trump is considering an executive order that would diminish a state’s authority to stop energy projects, making it easier to approve and construct pipelines across the country.